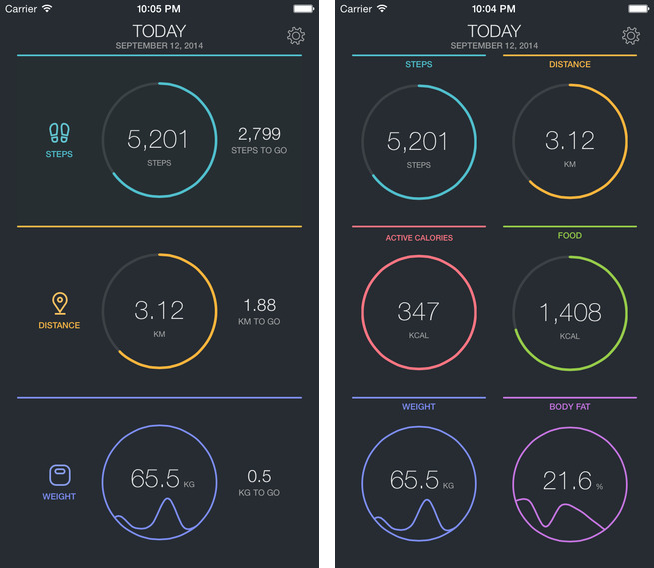 I briefly touched upon FitPort in my article about HealthKit apps. 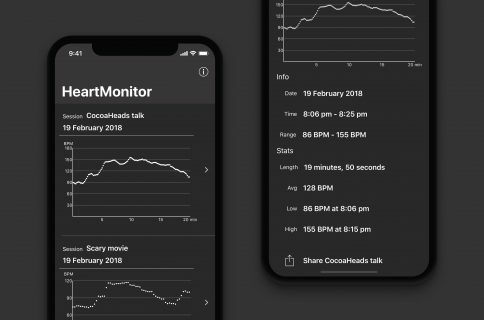 The app debuted today as the App Store’s first HealthKit-enabled application following yesterday’s iOS 8.0.2 software update that fixed a bug in iOS 8.0 which prevented HealthKit apps from functioning properly. 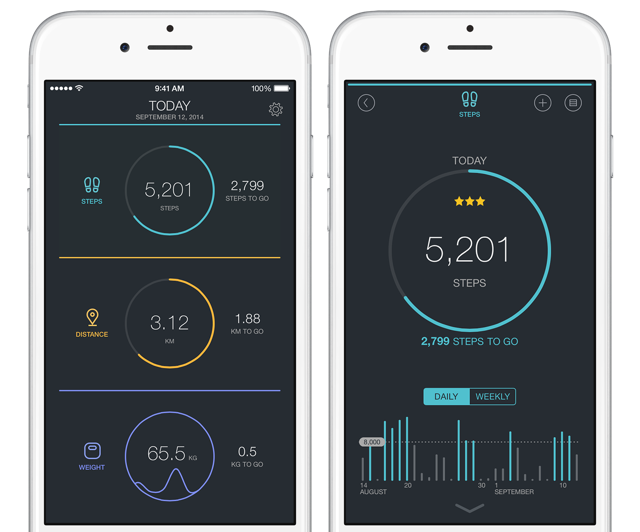 Created by Flask, FitPort isn’t yet another daily activity, health and fitness tracker, but a wannabe replacement for Apple’s stock Health app in iOS 8. Having spent an hour or so playing with it, I can safely conclude that FitPort deserves your attention so let me discuss it in greater detail. 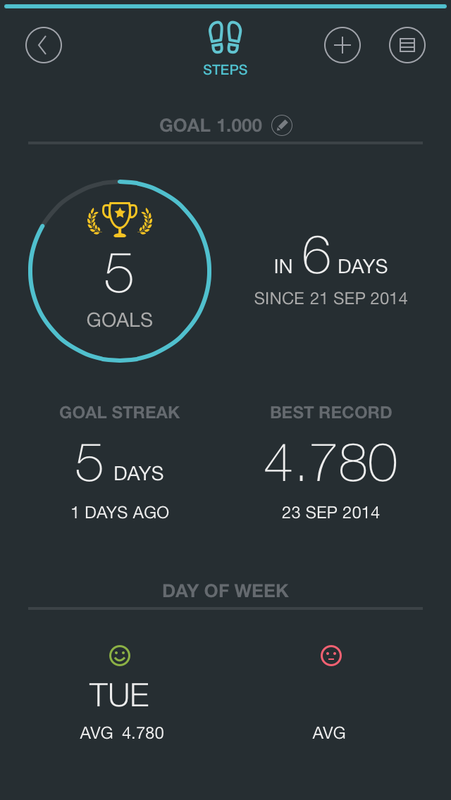 Above all, FitPort is a very promising fitness dashboard. Featuring a simple dashboard that can be customized to your liking, it provides an at-a-glance overview of your daily fitness statistics and lets you compare data to the previous day or week to see how active you’ve been. Taking a page from other tracking applications, FitPort also makes it easy to set your personal goals so you can monitor your progress. Like any app that uses HealthKit, FitPort first needs your permission to access your Health database. You’ll be asked to selectively choose which of the supported stats will get synced back into the iOS 8 Health database. 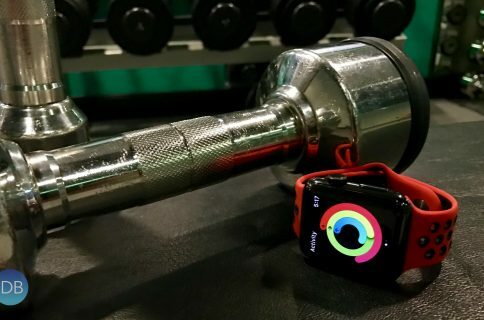 As you’ve probably realized by now, HealthKit is hugely convenient because it, along with other HealthKit apps such as FitPort, can feed Health its data about your physical activities. 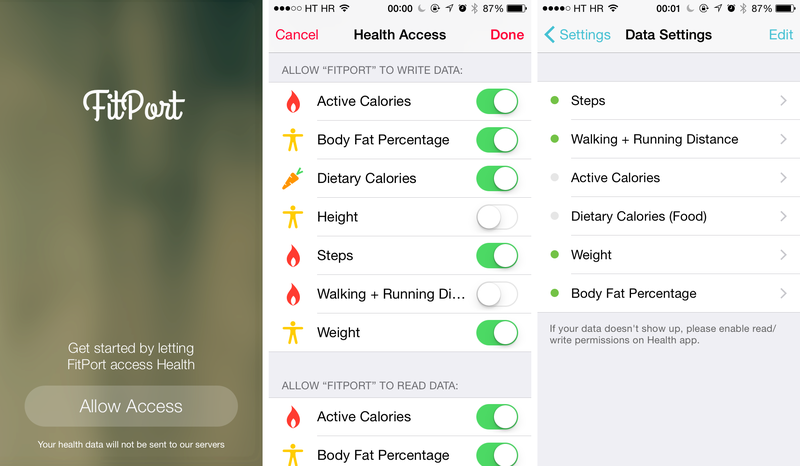 A quick backgrounder: because iOS 8’s Health app collates data from HealthKit apps and accessories, programs like FitPort help build a comprehensive outlook of your health. 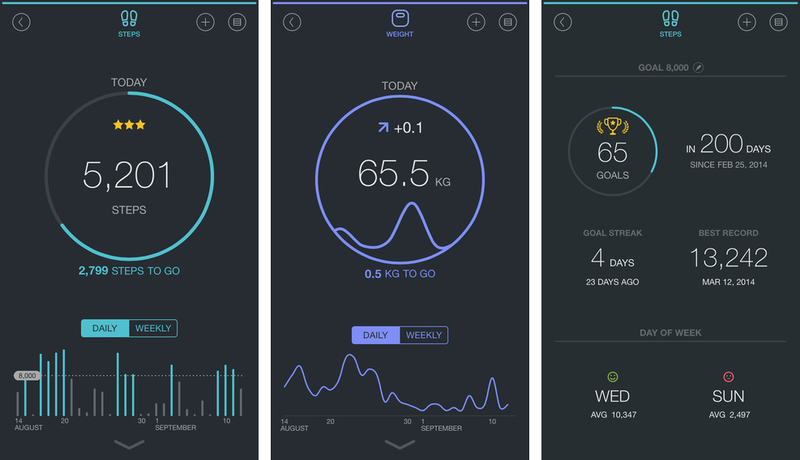 Health also lets you visualize data using pretty charts, manage your privacy, selectively share data with other apps and much more. You can input data manually into the app and all changes get synced immediately with Health. The following Health data types are supported by FitPort: Steps, Walking + Running Distance (mi, km), Active Calories (kcal, kj), Dietary Calories (kcal, kj), Weight (lb, kg, stone) and Body Fat Percentage (%). Privacy-minded individuals needn’t worry: you always have complete control over every bit of information you’d like shared with Health — just use the ON/OFF switch next to each category you’d like synced with Health, as seen on the image below. The good news is, this level of privacy isn’t specific to FitPort as Apple demands all HealthKit apps provide the same granularity. This lets users explicitly enable read and write capabilities for every supported Health data, from Active Calories to Body Fat Percentage to many, many more. It gets even better: Health sync is two-way. As you can see below, FitPort was able to import my Steps Taken from Health’s database. If you own an iPhone 5s, iPhone 6 or iPhone 6 Plus, here’s the thing — your device already has some basic data to work with. Go ahead, try it yourself: first launch Health, then tap Health Data on the toolbar and finally add Steps and Walking + Running Distance from the Fitness section to your dashboard. But where did this data come from? Thank Apple-designed M7 and M8 coprocessors for keeping track of your motion activity in the past seven days, without impacting your battery, because these chips monitor the iPhone’s sensors without ever waking up the main A7 or A8 processor. Wrapping up, FitPort still needs some work. For starters, the app lacks a food database so you must use other apps to log calories. I’m also disappointed that active calories are not calculated automatically, which is a shame, really. Additional Health categories will be integrated over time, the Tokyo, Japan-based developer promised. FitPort costs two bucks a pop and in my personal opinion is a money well spent. The 7.1-megabyte app does not run natively on iPads. iOS 8.0 or later is required. Other health, fitness and nutrition tracking apps enabled for HealthKit today: MyFitnessPal, FitStar Personal Trainer, WebMD, Yummly and Carrot Fit, with many more to gain prominence in the coming days for sure. Now that I’ve seen what’s possible with third-party HealthKit integration, I’m very much excited about what the future holds.